The first among you must be the servant of the all. During the season of Great Lent, we prepare ourselves to take part in the glorious resurrection of Jesus Christ along with his suffering for us through his passion and crucifixion. It was a preplanned undertaking of Jesus and he predicted it on several occasions to prepare his disciples. Today we reflect on the third prediction of Jesus on his passion, death and resurrection followed by his instructions on how a disciple should behave as a servant and aspire for higher position in heaven through service than competing for prominence in this world. Jerusalem is on a high mountain region approximately 2,500 feet above sea level. God had asked Abraham to sacrifice his son Isaac in that place. Regardless of where one was traveling from, that person would be going up to reach Jerusalem. The climbing was especially felt when one was walking on the street that lead to Jerusalem. So, Jesus was climbing up to Jerusalem. “Going up to Jerusalem” has also a spiritual meaning because it was the site of the temple of God, “the Mountain of the Lord’s House.” According to the prophesies, Jerusalem was the peak of the world from where the Lord’s instruction would come to all nations. “In days to come, the mountain of the LORD’s house shall be established as the highest mountain and raised above the hills. All nations shall stream toward it.” (Isaiah 2:2). “Many nations shall come, and say, ‘Come, let us climb the LORD’s mountain, to the house of the God of Jacob, that he may instruct us in his ways, that we may walk in his paths.’ For from Zion shall go forth instruction, and the word of the LORD from Jerusalem.” (Micah 4:2). The context is clearer in Mark 10:32, “They were on the way, going up to Jerusalem, and Jesus went ahead of them. They were amazed, and those who followed were afraid. Taking the Twelve aside again, he began to tell them what was going to happen to him.” The disciples were reluctant to go with Jesus to Jerusalem because they knew that the life of Jesus would be in danger there. However, Jesus was determined to go to offer his self-sacrifice. That was why Jesus was going ahead on the direction of Jerusalem, while the disciples were far behind him. Jesus called them to the roadside to share with them, in private, his mission and action plan so that the disciples would know what to expect. Out of the three passion predictions of Jesus, this is the most detailed. The other two are Matthew 16:21–23 and 17:22–23. This was a reference to the Sanhedrin that consisted of 71 leaders of the Jewish community in Jerusalem. The full title was "the chief priests, the scribes, and the elders," (Matthew 16:21). This was the supreme court in religious and political matters of the Jews, although it was enormously restricted by the Roman authorities. Jesus was sure of what all were going to happen in his end of life in this world. In fact, he took them for himself rather than bad things occurred to him. All the parts of this third prediction happened as follows: handed him over to the Gentiles (Mt. 27:2), mocked (Mt. 27:27–30), scourged (Mt. 27:26), and crucified (Mt. 27:31, 35), raised on the third day (Mt. 28:6). This was the prediction of Jesus on the humiliation and abuse that he was going to undergo from the pagan soldiers of Roman authorities. They expressed their hostility towards the Jews by shifting it on Jesus and making him the scapegoat. After Judas handed over Jesus to the soldiers of Jews (Matthew 26:49), the soldiers handed him over to the chief priest and the Sanhedrin (Matthew 26:57), then Sanhedrin handed over Jesus to Pilate, the Roman governor (Matthew 27:1-1–2), Pilate handed over Jesus to the public to decide between Jesus and Barabbas (Matthew 27: 17), Pilate then handed over Jesus to soldiers to crucify Jesus (Matthew 27: 26). Jesus predicted that his disciples will also face similar situation: “they will hand you over to courts and scourge you in their synagogues.” (Matthew 10:17). The resurrection of Jesus is attributed to the Most Holy Trinity. All the three persons of God were involved in Jesus' resurrection according to the Bible. St. Paul writes in Romans 6:4, “Christ was raised from the dead by the glory of the Father.” Examples of other references of God the Father raising Jesus are: Acts 2:32; 2:24; 10:40; 13:30 and Galatians 1:1. 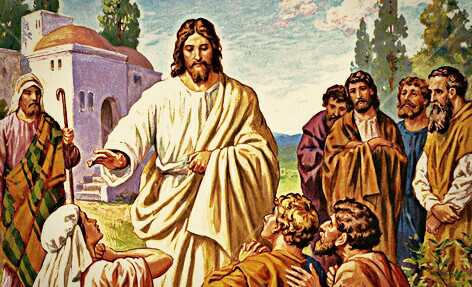 Jesus himself came back to life according to John 2:19: “Destroy this temple and in three days I will raise it up.” In John 10:18, Jesus said that he had power to lay his life down, and power to take it up again.” St. Paul in Romans 8:11 and St. Peter in 1 Peter 3:18 specify that the Spirit of God raised Jesus from the dead. Thus, we see that the resurrection of Jesus is attributed to the Most Holy Trinity. The apostles came to realize the real nature of Jesus’ Kingdom only later. They believed that Jesus the Messiah would establish Davidic kingdom. As chosen people, they were competing for higher positions in that kingdom. The term “sit” in Bible denotes “to remain in a state of power over others.” By asking the favor of sitting on the both sides of Jesus, the mother and her sons wanted a place higher than all other apostles. Jesus had promised apostles that they would reign in the kingdom he was going to establish. (Matthew 19:28). However, James and John wanted to be the first among the apostles. Whenever Jesus presented his upcoming passion and death, the disciples were debating on who would be greatest among them to succeed Jesus or to be in the highest rank with him. This showed their worldly desires before the descent of the Holy Spirit upon them. “You” can mean singular or plural. Here it was used in the plural sense and addressed to James and John. They were replying to the question. The question was again addressed not to the mother but to the two sons. Cup in the Bible was a symbol of life and was used in a positive or negative sense. In the positive sense, a cup could mean whatever God fills in one’s life (Psalm 11:6 16:5), or the blessings of life that God provides (Psalm 23:5), or a thank-offering from man to God (Exodus 29:40, Psalm 116:13). Though Jesus did not promise what the two disciples asked along with their mother, Jesus granted what he could during his public ministry. The two were among the first four (Peter, Andrew, James and John) selected as the initial disciples of Jesus and were prominent among the others (Mark 13:3). Peter, James, and John were an intimate group of Jesus. They alone were admitted at some prominent occasions like the miracle of the raising of Jairus's daughter (Mark 5:37; Luke 8:51), the Transfiguration (Mark 9:2; Matthew 17:1; Luke 9:28), and the Agony in Gethsemane (Matthew 26:37; Mark 14:33). All the twelve apostles of Jesus were obsessed with worldly positions which was quite natural. Two of them trying to take advantage excluding others also was a normal human behavior. The ten were afraid that if Jesus had granted the request, they would become subservient to the two. This gave an opportunity for Jesus to present the style of leadership he wanted to instill in them. Jesus here acknowledged the worldly leadership style. But he wanted his disciples just the opposite of that. Jesus was at the service of his family until he left home for his public life, and then at the service of all humanity. He served humanity by preaching, extending his service to all who asked his favor. He never demanded any service from others. The word "ransom" means a price demanded or paid for the redemption of a slave or a captive. By the fall of first parents, we are captives to sin like a child born to slave parents. We are under condemnation (Ephesians 2:3; Romans 3:9-20, Romans 3:23; 1 John 5:19) and curse (Galatians 3:10). A slave child cannot rescue himself regardless of how much he tries. So, God came among us to rescue us. Jesus suffered and died for us giving his life as a ransom for our liberation from eternal damnation. The term “many” is a reference to Isaiah 53:11-12 where it did not mean for few but the outcome of Christ's redemption. Jesus used the same word when he instituted the Holy Eucharist. After blessing the cup, he said: “This is my blood of the covenant, which will be shed for many.” (Mark 14:24; Matthew 26:28). The rabbis and the Qumran community used this term for the community of faith or the chosen people. St. Paul also use “all” and “many” as interchangeable terms in his letter to Romans verses 18 and 19. So the redemption of Jesus is intended for all. Many will find salvation from him. 2. While heading towards Jerusalem, Jesus was sure of the brutal torture and painful crucifixion he would undergo. However, he was also sure of his resurrection and accomplishment of his mission. Every missionary and Christian that face religious persecution are also undergoing similar experience. We need to pray for them and support them. We also shall not give up our faith and hope amid challenges in Christian living.